Paul had business in Orlando this past week, so we did something we haven’t done before. We planned a vacation, mainly in Key West, during hurricane season. I flew to Orlando and met him there this past Thursday. I finally got to meet Paul’s boss and most of his co-workers from around the world (Croatia, Brazil, Switzerland, and Australia). This alone was worth the trip out for me. We had a lovely meal at Moonfish that night and headed south to Sanibel Island the next day. Our plan was to spend two nights here in Sanibel, but we have extended it to four, owing to Isaac. Paul and I are having way more fun than a couple whose plans have been derailed by a hurricane should. 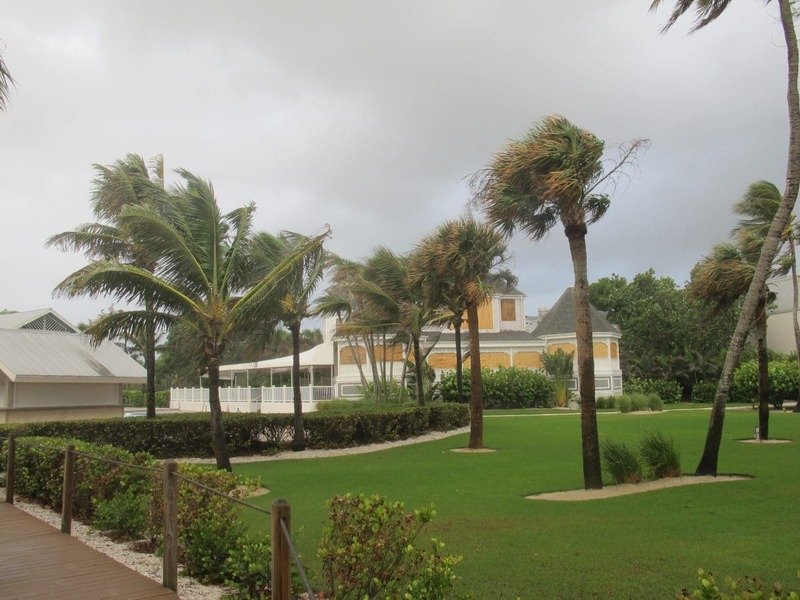 Our digs at Casa Ybel are perfect for storm viewing. We can see miles out to sea from our sheltered lanai and the sounds of the wind and the waves are intoxicating (along with the hurricane party drinks). So, while we would rather be in the pool (me) or at the bar next to the pool (Paul) at present, we continue to enjoy ourselves. It will be a relief to see the end of Isaac but in the meantime we are hunkered in with plenty of food, water, candles, etc. So far, so good here on Sanibel. The resort has taken all necessary precautions and I am shocked and delighted at the fact that we haven’t lost power, like so many of our Florida neighbors have. We were upgraded upon arrival and have a full kitchen and a full bath, which means we were able to stock up on groceries and fill the tub with extra water, just in case. If you are going to be stuck-in, this is the place for it! I cannot seem to get a shot of the Atlantic that does it any kind of justice. We both love being on the ocean and to see miles out from our quarters during a storm is pretty awe inspiring. Below is a mediocre (sorry) zoom shot from the deck. I am trying to figure out how to post a short video, which gives a better idea of what the storm is really like. Thank you, friends and family for checking in on us. We are doing just fine and are hopeful that Isaac will decide to go easy on the Gulf Coast and everywhere else in the coming days. And for those of you in its path, please continue to keep us posted, either here or on facebook.